The Volkswagen Group is a colossal, car-building behemoth. Whether it’s the biggest such behemoth depends on the year and how General Motors and Toyota are doing at the time, but there’s no denying the VW Group is massive. I think it may also be number one in at least one very specific way: No other carmaker makes as many different types of internal-combustion engines as the VW Group. By “different types” I mostly mean layouts and designs of engines. You know, high-level, big-picture stuff, like inline-fours or V6s. For whatever reason, the Volkswagen Group makes a bewildering variety of engine types across all its brands (Volkswagen, Audi, Porsche, Lamborghini, Bentley, Skoda, SEAT, Bugatti, and that’s not even counting Ducati motorcycles or its large truck divisions—for this purpose, I’m just talking about gasoline engines for passenger cars. This doesn’t even yet count full electric cars, which the VW Group is going big on starting in 2019 and across multiple brands. Whereas most carmakers have largely standardized on inline-fours and some V6s or V8s, Volkswagen seems to feel compelled to really dig deep and explore all kinds of options, including opposed engines and weirdos like VR and W-configuration engines. And it doesn’t stop there; the company is full of high cylinder-count pervs, building a 10-banger, two kinds of 12-cylinder engines, and even a bonkers 16-cylinder beast. Probably the second runner-up to VW is Fiat Chrysler, which at this point makes everything from tiny TwinAir inline-twos up to howling V12s and turbo V8s in Ferraris. But even FCA can’t hold a candle to VW’s wacky diversity. 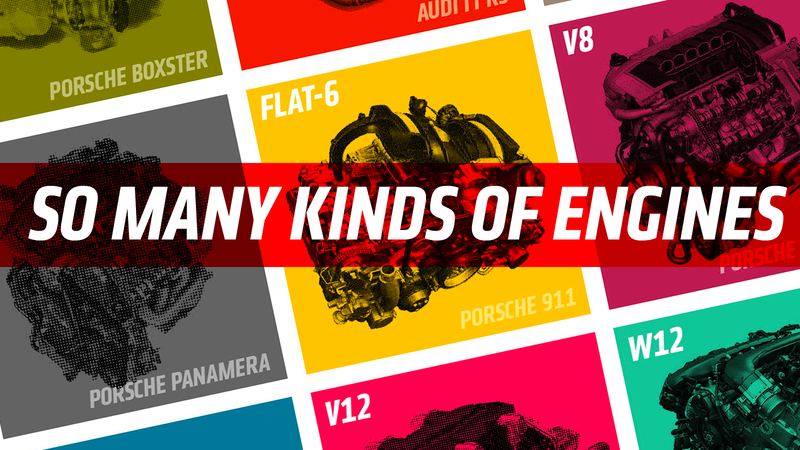 Once you really start thinking about it, it’s sort of nuts how many radically different kinds of engines the Volkswagen Group builds. It does every major layout type: inline, vee, and horizontally-opposed, and also the strange narrow-angle VR engines (essentially, a V-type engine but with only one cylinder head) and W engines, which are like multiple VR engines ganged together. Plus, it’s one of the few remaining automakers to still make weirdo engines like an inline-five. Anyway, I figured this degree of engine-type bonkers-ness deserved a chart. So here you go: every major type of gasoline engine the VW Group companies make, and an example of at least one car that uses it, minus motorcycles (Ducati) or big trucks (MAN, etc.) because if I included those the chart would get even more insane. I hope you find this useful. As always, make sure you have a nice clean print of this before taking it to your local tattoo shop for reproduction on your back or chest.